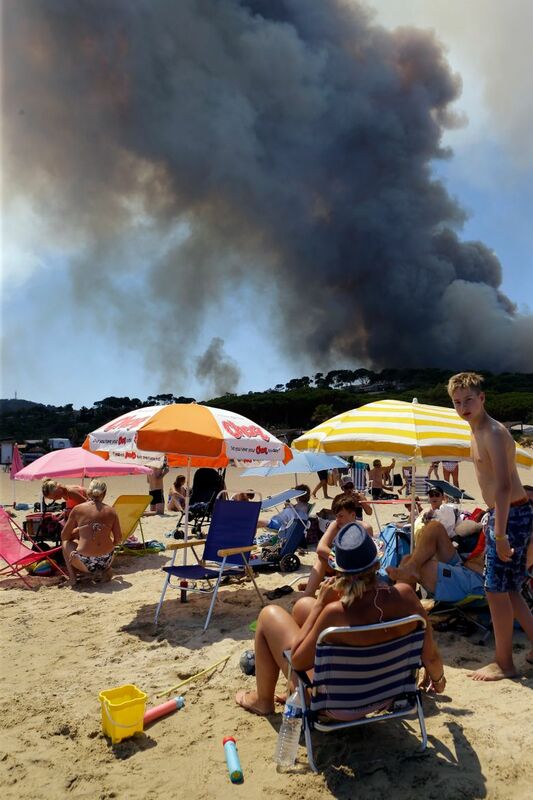 BORMES-LES-MIMOSAS, France (AP) — Backed by planes dropping water and fire retardant, more than 1,000 firefighters battled wildfires Wednesday that billowed smoke into the sky over France’s southern Cote d’Azur coast and forced the evacuation of at least 12,000 people. France’s prime minister, visiting the area, predicted a grim day ahead. Large swaths of Mediterranean forest have been left bare and blackened after three days of fires. 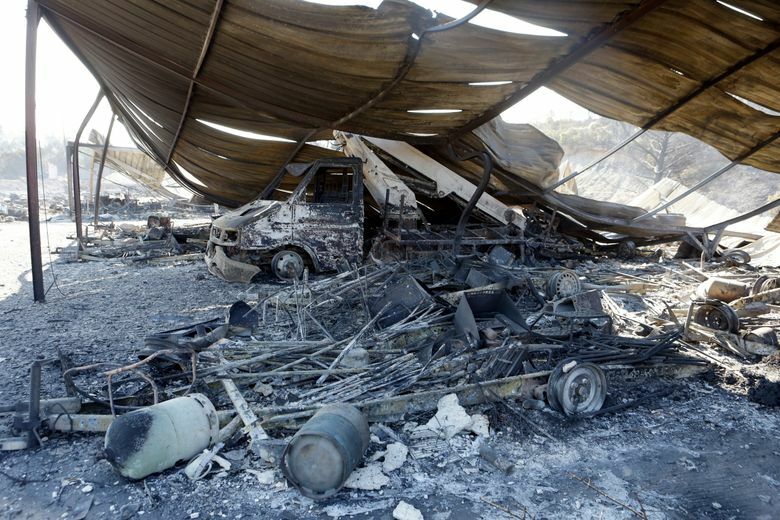 About 250 trailer homes, a hangar, an atelier and several vehicles were burned in the blazes, but no one has been injured so far, the prefect of the Var region said. 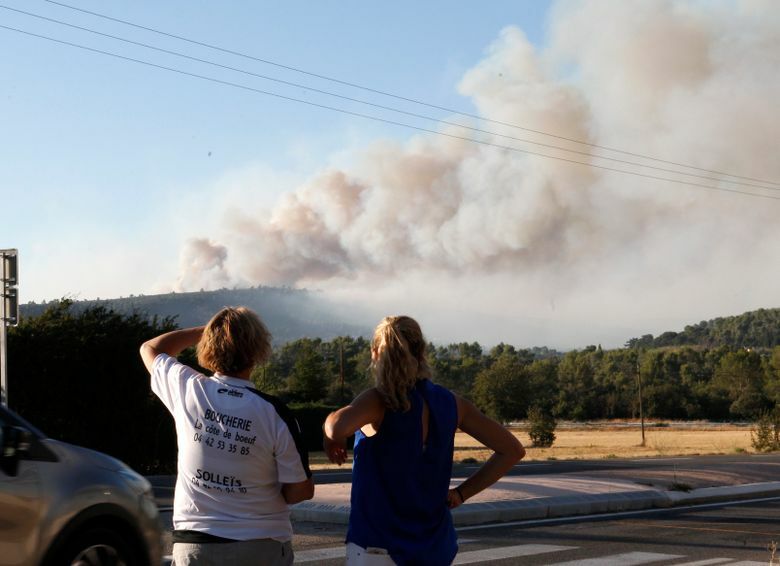 Residents and tourists were evacuated early Wednesday after a ferocious fire whipped by strong Mistral winds spread from La Londe-Les-Maures to dense forests around the picturesque hilltop town of Bormes-Les-Mimosas. 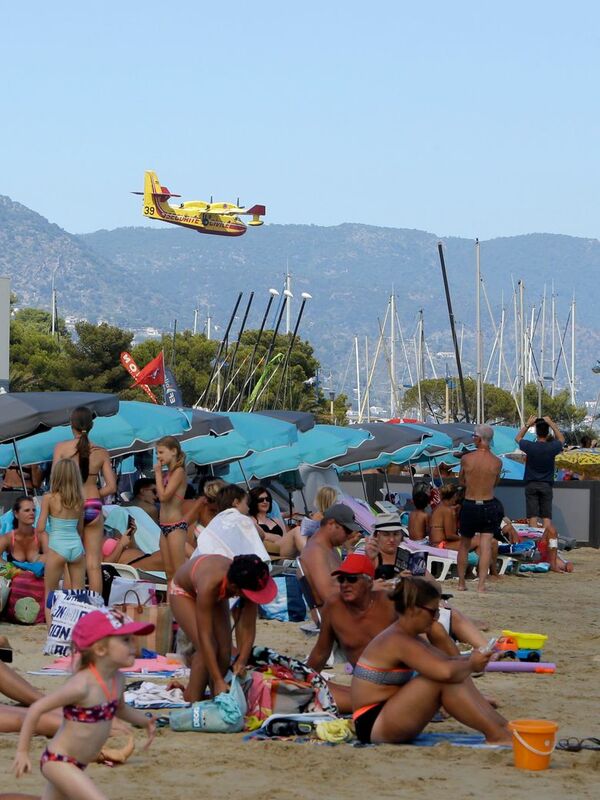 About 60 people were evacuated by boat from nearby Cap Benat. “There will be more fires tomorrow,” Prime Minister Edouard Philippe said. He traveled to Bormes on Wednesday night, flew over the devastated region and met with firefighting personnel. 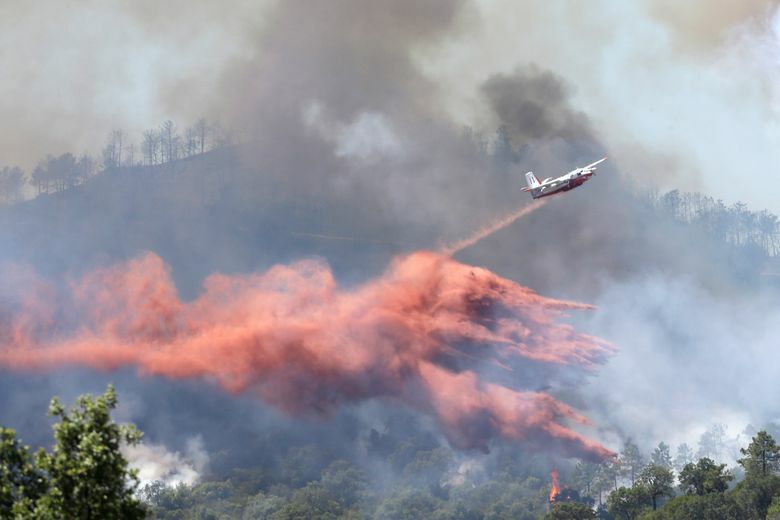 Firefighting aircraft made more than 500 drops of water or retardant on Wednesday, Phillipe said, and only three fires remained active in the Var region — out of dozens that started Wednesday. But “the situation remains difficult, I must say it. Like me, you feel the wind is blowing,” the prime minister said. 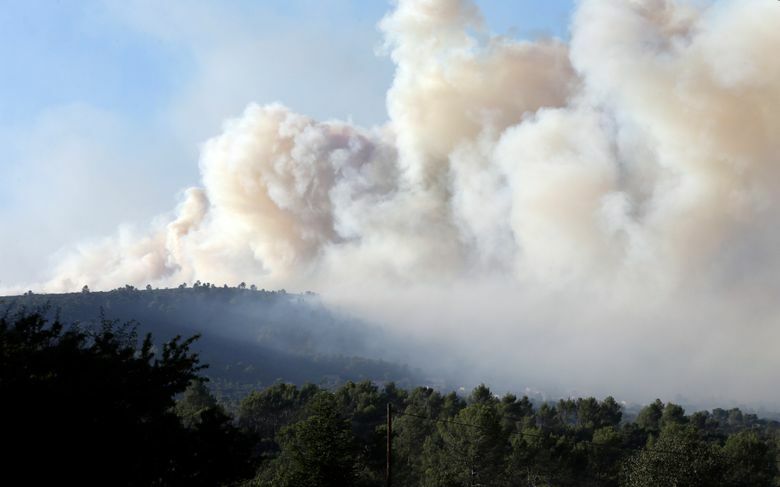 Further south of the French mainland, flames ate through 2,000 hectares (4,950 acres) of forest on the northern end of the French Mediterranean island of Corsica, in what was the largest blaze in France. 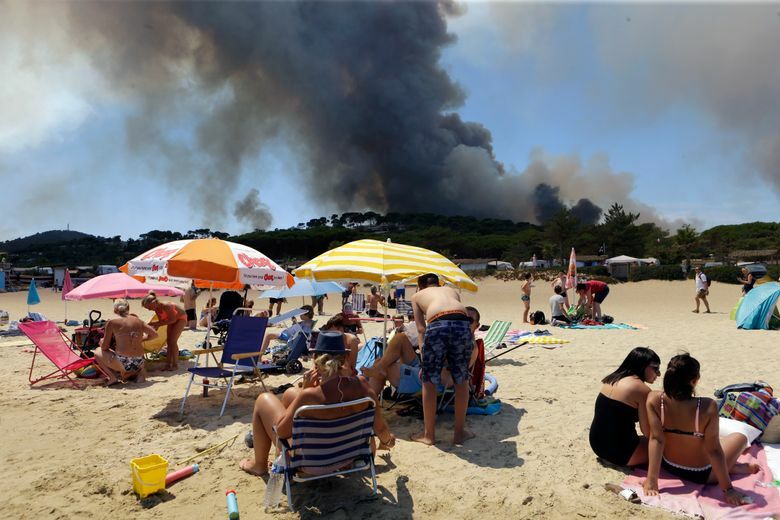 Fires also were blazing across parts of bone-dry Portugal and Italy. 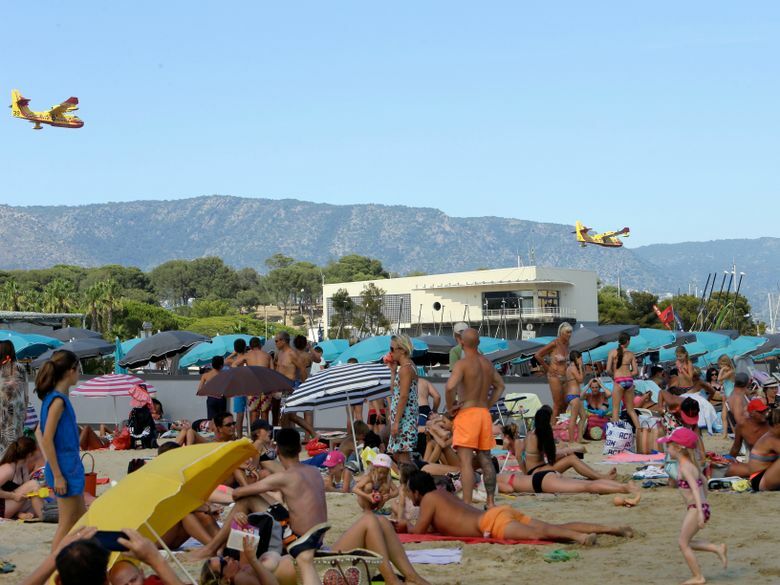 Tourist Francoise Roparse, who was visiting the south of France, was among the evacuees awakened in the middle of the night who found shelter in a sailing club near Bormes. Dozens of people initially spent the night on a beach, but public spaces pressed into service as emergency shelters were filling up. The disaster, which hit at the height of the summer season, challenged regional governments with economies that depend on tourism. The town of Bormes tweeted a call for donations of towels for the evacuees staying in the local gymnasium. 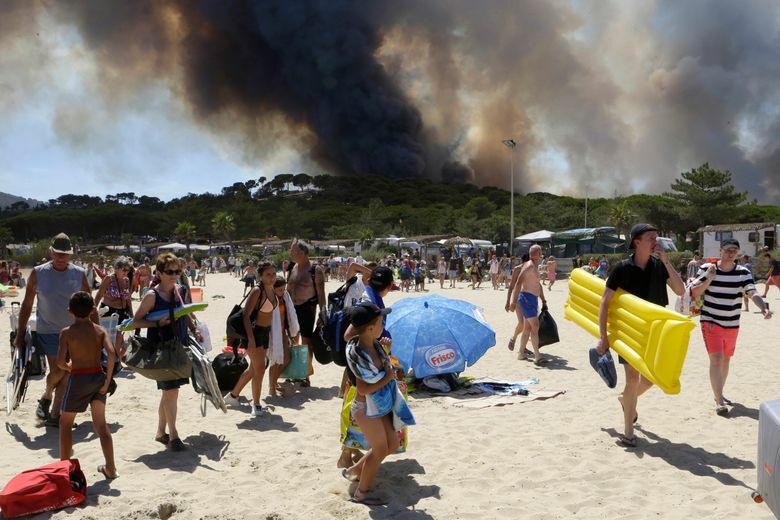 The wildfires began raging along France’s Mediterranean coast on Monday, forcing smaller, scattered evacuations as flames reached a corner of Saint-Tropez. 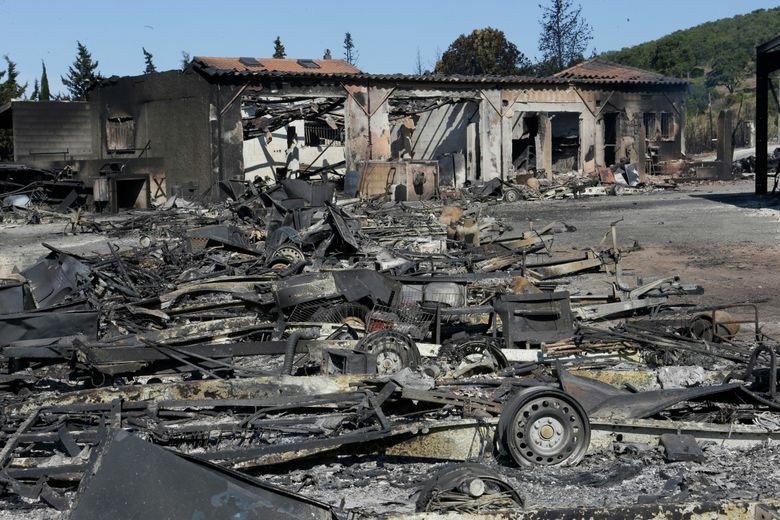 Since noon Tuesday, French firefighters had conducted about 100 operations. Numerous firefighting aircraft are grounded for repairs, and nine are 60 years old, Eric Faure of the National Federation of Firefighters told BFM-TV. The prime minister said France plans to buy six new aircraft to beef up the country’s firefighting capabilities. For now, it has asked the European Union for more planes and Italy provided one Tuesday. Still, a pilot of a Canadair firefighting aircraft said there were not enough planes in the sky. 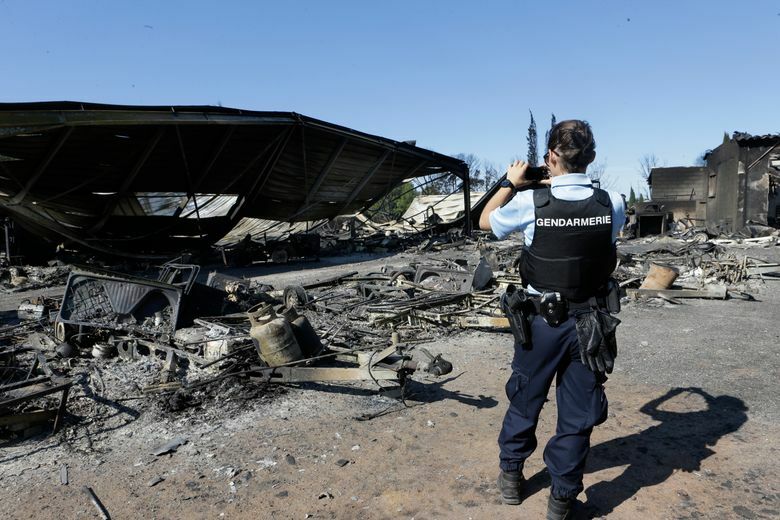 Marion Manent, whose husband’s trailer homes were burned, was suspicious about the origins of the fire around La Londe. “Someone is certainly responsible … for me, he is a killer,” she told BFM-TV. The prime minister said an investigation has been opened to identify the reasons for the multiple fires. 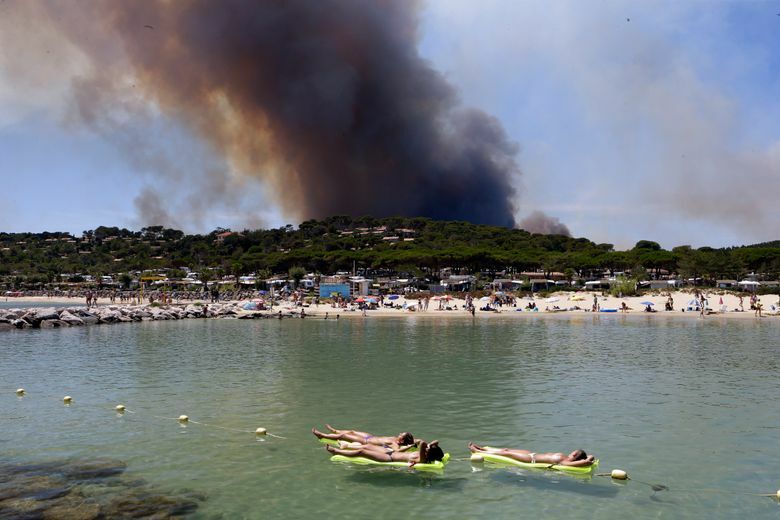 France’s Mediterranean coast is particularly vulnerable to fires, with its massive back-country forests, often dry in the summer, and hot Mistral winds blowing across the sea to fan the flames. 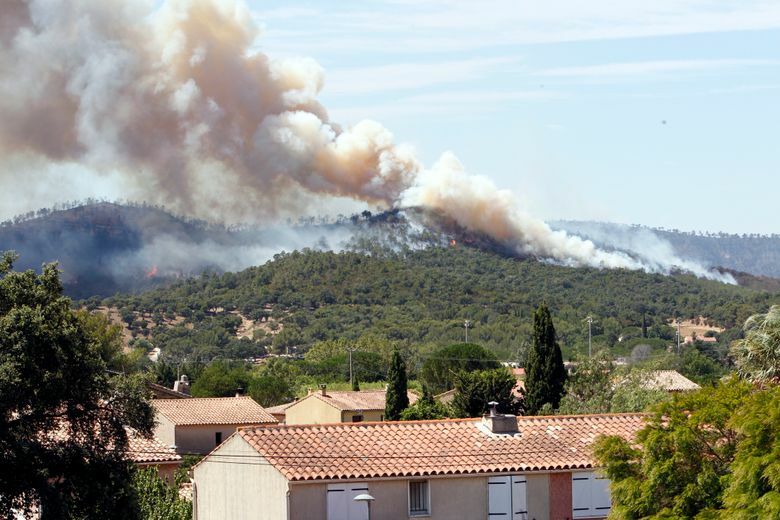 As thick black smoke billowed above the crests of hills, Col. Eric Martin of the Var firefighting unit told BFM-TV that French crews were trying to contain the flames that had run through 1,300 hectares (3,210 acres) around Bormes. 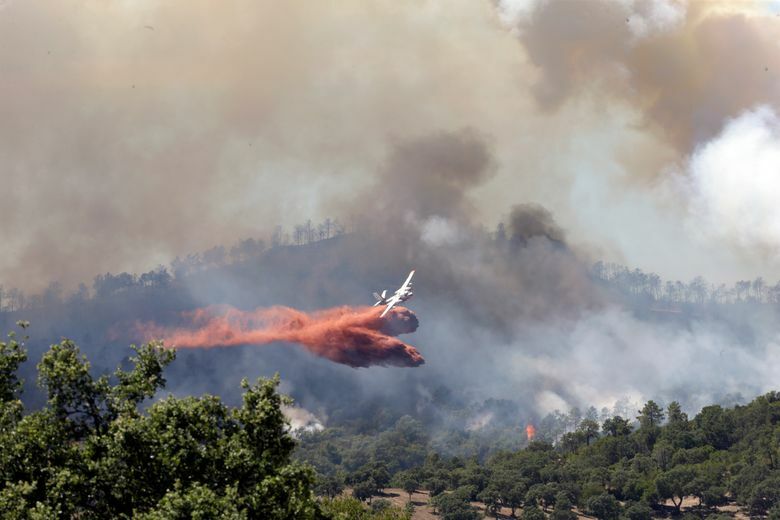 Four planes and a fire-fighting aircraft dropped water and retardants on the blazes. Further east, another 400 firefighters were battling a blaze in Artigues that burned up to 1,700 hectares (4,200 acres) of forest. 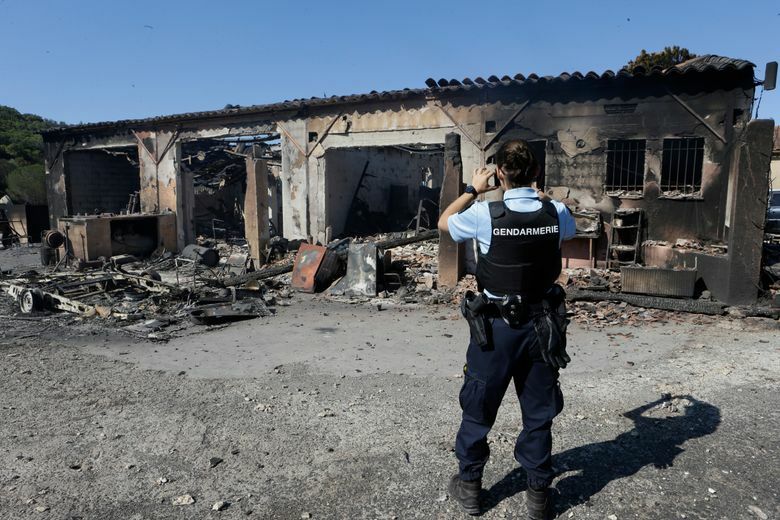 In addition, a fire that was contained Tuesday evening in La Croix Valmer after burning two homes and leaving one firefighter seriously injured reignited on Wednesday, the Var prefecture said. 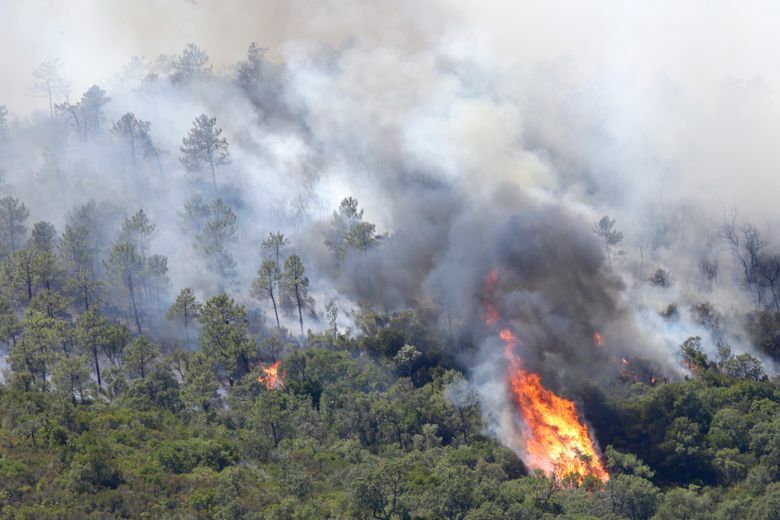 In central Portugal on Wednesday, billowing smoke made visibility too poor to use water-dropping aircraft on the region’s flaming pine and eucalyptus forests. More than 2,300 firefighters with over 700 vehicles battled 13 blazes, with flames driven by powerful winds. 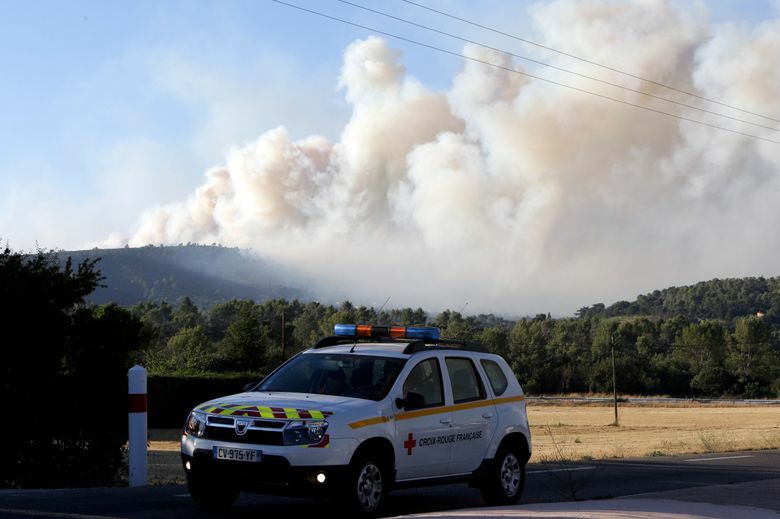 The worst-hit areas were located 200 kilometers (125 miles) northeast of Lisbon, where the fires briefly forced the evacuation of some hamlets and the closure of a section of highway. 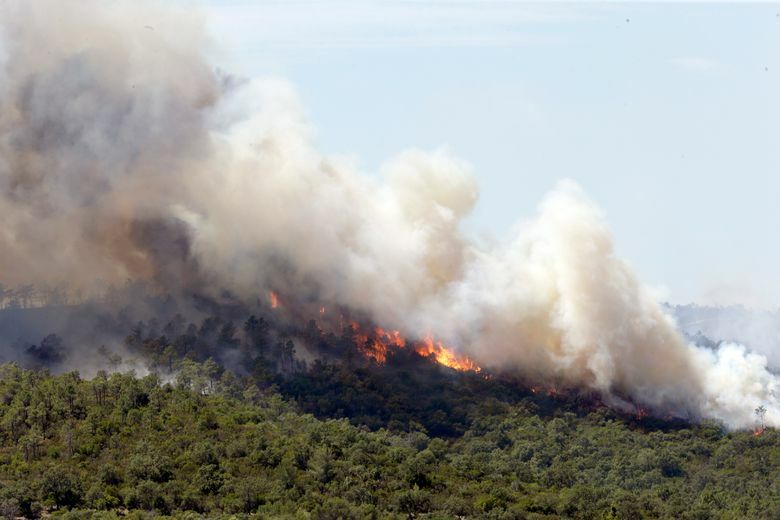 Portugal’s peak fire season, which usually starts after July 1, began early this year amid a severe drought. Last month, 64 people died trying to flee a forest fire in Portugal. In Italy, where wildfires have raged for weeks, firefighters responded to 26 requests for water and fire retardant air crops on Tuesday throughout central and southern Italy, including Calabria, Sicily, Sardinia, Lazio and Puglia. The Coldiretti agriculture lobby said 50 million bees were destroyed along with their hives in fires on the slopes of Mount Vesuvius. Coldiretti said another 20 percent of the bee population is estimated to have become disoriented by all the smoke and died as a result. This story has been corrected from an earlier version to show that the number of bees killed in Italy was 50 million, not 50 billion. Hatton reported from Lisbon. Elaine Ganley in Paris and Colleen Barry in Milan contributed to this report.